This page is about the French utility helicopter SA.342M Gazelle. For other version, see SA.341F Gazelle. The SA.342M Gazelle is a rank VI French utility helicopter with a battle rating of 9.7 (AB/RB/SB). 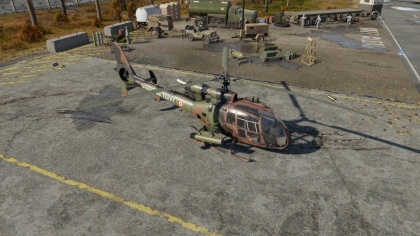 This helicopter was introduced in Update 1.87 "Locked On". Initially designed by Sud Aviation in 1966, the Gazelle helicopter project (SA 340, SA 341 and SA 342) was continued by Aérospatiale as a French five-seat transport, scout and light attack helicopter manufactured in both France and the United Kingdom. Manufacturing licenses were granted allowing a Yugoslavian company SOKO and the Arab British Helicopter Company in Egypt to also produce these aircraft. The Turbomeca Artouste Astazou XIV turbine engine powers the SA.342M Gazelle. Initial testing of this helicopter utilised a standard tail-rotor taken from the Alouette, however, design changes switched to a Fenestron-style tail, the first helicopter to do so. The Fenestron tail or “fantail” differs from a conventional tail rotor as it contains eight to eighteen blades housed within the tail unit of the helicopter. Advantages of the Fenestron include substantial noise reduction, protection of tail rotor damage from contact with other objects and protection of ground personnel working around the tail section. With the aid of the Fenestron tail, the Gazelle was the world’s fastest helicopter in its class during its early years. 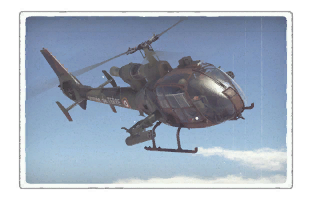 In the service of the French, the Gazelle SA.342M was utilised as a light support helicopter equipped with various rockets, anti-tank missiles and air-to-air missiles. Seven different suspended armament configurations allow the SA.342M to fulfil a versatile role in the fighting zone whether sniping armoured vehicles or hunting other aircraft loitering around the battlefield. Fast and agile with a punch, the Gazelle is a formidable foe with many surprises. Describe how the helicopter behaves in the air. Maximum speed, manoeuvrability, speed and allowable loads - these are the most important characteristics of the vehicle. This page was last edited on 1 April 2019, at 14:02.